I love playing my Nintendo DS Lite in the bathroom (pre-wipe of course) and it’s something I look forward to each day, especially at work because it’s really the only private alone time I get at work. Last night I was at work late at Starz Animation in Toronto (ya I know, I completely neglected to blog about coming to Toronto to continue working on 9 and instead I’m blogging about playing video games on the toilet, but that’s just the way I roll…). Anyway, I was at work late and I had to wait to use the bathroom until after the cleaning lady had finished in there. I didn't want to look like a slacker so I resisted the urge to play my DS at my desk, but as soon as the cleaning lady was done, I flicked on my DS and headed into a stall for a little Mario Kart DS action. The toilet seat was still wet from the cleaning lady’s wipedown, so I set down my DS, already open and powered up, on top of the big double-roll TP dispenser and reached down to grab some TP to wipe off the seat. When I pulled on the TP to tear off a piece, the whole side of the dispenser flipped open, dumping my DS and one of the rolls of TP straight into the toilet. In dazed disbelief, I stood there, staring down through the tube of the TP roll, which was too big to actually fall into the toilet, and I watched my precious electronic device sink deeper into the clean clear toilet water, still displaying the race-track fly-over animation. As the DS hit bottom, I snapped out of my stupor and sprang into action. I tossed aside the TP roll but shock set in again when I saw the beautiful glowing Dual Screens, for which the DS is named, fizzle out and dim to a barely visible frozen image of Yoshi at the starting line, his opponents just starting to speed away. My heart sank as I plunged my hand into the toilet and snatched up my DS. It was dripping wet, a small piece of TP clinging to the top screen still displaying the same dim frozen frame. I flicked off power switch, grabbed some TP from the fallen roll and started to wipe off the DS, but it just seemed too wet. "It's ruined," I thought. "There's no point." So I set the DS on top of the sticky Canadian Maxim magazine on the tank behind the toilet (where I should've set down my DS in the first place), wiped off the toilet seat, which was even wetter from the splash, pulled down my pants, and sat down. But nothing happened. It was as if my bowels were telling, "sure we waited a long time for the cleaning lady to finish in the bathroom, and sure we just about crapped ourselves when the DS fell into the toilet, but I'm gonna hold the fort down here while you use that brain of ours up there to figure out how to fix this so stop wasting our time sitting here moping and dry the damn thing off!!!" So I pulled up my pants and ran out to find some paper towels. I took everything out of the DS that I could (DS game card, GBA rumble pack card, stylus, battery), dried it all off with towels and left the parts out to air-dry. I wished I had the special Nintendo "tri-wing" proprietary screwdriver so that I could fully disassemble it because it was clearly soaked inside and out. I was too impatient to see if it was still working, so after an hour of letting it air-dry, I put the battery back in and turned it on. The top screen was dim and flickering and after a few seconds it faded to black. I thought for sure that I had just shorted out the DS, but I wasn't ready to give up so I collected the parts and ran back to my hotel room, where I remembered seeing a hair dryer in the bathroom. I used the hair dryer to blow-dry it inside and out for a good 10 minutes and then I left the DS disassembled over night, resisting the temptation to test it again. I didn't have much hope the next morning as I put my DS back together, but when I turned it on everything seemed back to normal. Both screens were fully illuminated and the flickering was gone. After 30 minutes of testing it out I was convinced that my DS had completely dried out and survived full submersion in water without any permanent damage. I swear, Nintendo makes a damn fine product. 76 feedbacks »	| In Rants, Fun | on Jan 19, 2008	| by joshmorgan | 845 words, . "YOU DON'T WAIT! IMPEACH THEM NOW!!!" Send feedback »	| In Rants | on Nov 17, 2007	| by joshmorgan | 18 words, . Send feedback »	| In Rants, News | on Nov 6, 2007	| by joshmorgan | 8 words, . My mom called me this afternoon to tell me that she took this pictures of the orange sky over Ventura County today. 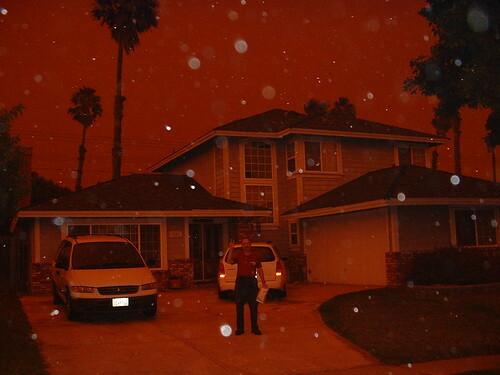 Smoke from the fires in Southern California, including Castaic, Agua Dulce, Moorpark and Malibu, had blocked out the sun and ash rained down like snow, as clearly illuminated by my mom's flash in the above pic of my dad in our driveway at 2pm. The darkness triggered the automatic light-sensors on the streetlights so they were on all afternoon. I really wanted to drive from LA up to Ventura just to check it out, but I was worried the ash would cause breathing problems for me. It looks like Kurt was home in Ventura this weekend because he also got some great pics of the fire, which he aptly described as an "apocalypse." Send feedback »	| In Pics | on Oct 22, 2007	| by joshmorgan | 135 words, . 1 feedback »	| In Lyrics | on Sep 20, 2007	| by joshmorgan | 23 words, . 1 feedback »	| In Lyrics | on Jul 12, 2007	| by joshmorgan | 31 words, . Send feedback »	| In Lyrics | on Jul 12, 2007	| by joshmorgan | 31 words, . 1 feedback »	| In Lyrics | on Jul 6, 2007	| by joshmorgan | 19 words, . I usually don't blog about hoax emails, but since I haven't blogged much about anything recently, and cuz I spent a decent amount of time researching and replying to the hoax email, I decided to post my response with a little bit of extra commentary. on the highway is old). Don't do it again because 2nd time is going to be double. 3rd time triple, and 4th time license suspended. 7. Speeders can only drive 3 miles above the limit. 9. As of 07/01/07 cell phone use must be "hands free" while driving. My BS-alarm goes off automatically whenever I receive an email with "FWD" in the subject but this email wasn't explicitly a forward. Still, the claims in the email seemed suspect, especially the fine dollar amounts. Sure enough, after a little research, I discovered that the email was loaded with factual inaccuracies and half-truths. First off, this email originally circulated in January 2007 and stated that the "new laws" went into effect 1/1/07, so clearly someone has revived the email by changing the "1" to a "7" and sending it out again for the mid-year date of July 1st. Also, the original email was specific to California, and though the email I received didn't specify, I had already assumed as much so the remainder of my fact-checking was focused on the CA DMV. Secondly, fines for traffic citations are jurisdictional based off of CA state guidelines so there are no fixed dollar amounts and the fines quoted in this email are ridiculously high, like 3 times the actual amounts. Also, "hands-free" devices will indeed be required with cellphones for drivers, but NOT UNTIL JULY 2008. #1 thru 4 all have inflated fines. Most of these violations have fines around $150, but again, those fines change county to county and the fines could increase if they are compounded with other multiple violations. As far as I can tell, carpool lane violations still have a MINIMUM $271 fine as stated on the signs. If the law changes, the signs will change. #5: ALL traffic citation fines can be doubled in construction zones, but using a cellphone without "hands-free" while driving isn't illegal until July 2008. #6: Everyone over the age of 16, not 18 like the email misstates, is required by law to wear a seat belt when they are in a vehicle. Citing a passenger for noncompliance has always been an option. If the passenger is under 16, the driver, or the parent or guardian if they are present, even if they are not driving, can be cited for the child. #7: The speed limit is just that, the LIMIT. It is illegal to drive faster than the posted limit, so whether you are going 1 mile, 3 miles, or 100 miles over the limit, you could get a ticket. However, the amount of the ticket does increase at certain intervals of speed over the limit. For example, the statewide schedule for 1-15 mph over the limit is $146. And your chances of getting pulled over for speeding is usually relative to the posted limit. Going 3 miles an hour over a 5 mile per hour limit is probably much more likely to draw attention from authorities than going 3 miles over a 65 mph limit. Also, I didn't find anything in my research to suggest that 3 miles over has any special significance to speeding laws. #8: "DUI = JAIL" has be the law for decades, so at least that part is true. Drivers under the influence are thrown in jail to sober up for at least a few hours, possibly longer if they are repeat offenders or if they meet other criteria warranting "enhanced penalties" like an extremely high blood-alcohol concentration or a child passenger. I'm not sure if DUI's stay on your record for 10 years as the email states, but based on the factual inaccuracy of the previous "facts" I'm guessing this number is wrong too. And even if the current length of time a DUI stays on your record is indeed 10 years, unless this law went into effect July 1st 2007 like the email states, this "fact" is not entirely true. UPDATE: After a little more research, I discovered the length of time that DUI's are reported on your driving record has indeed increased from 7 to 10 years as of January 1st 2007 but this email falsely implies that prior to 2007, DUI's did NOT get you jail time so I'm not willing yet to declare this one the only truthful fact in the email. #9: Again, the cellphone ban doesn't go into effect until JULY 1st 2008 so you have a full YEAR before you are required to use your hands-free devices. Still, just because it's legal for one more year does NOT make it any less dangerous. They're making it the law for a reason, duh! But even if someone continues to drive while talking on a cell after the law actually goes into effect, they are only going to pay $20 fine of the first offense, and $50 for repeat violations according to the actual statute. Yet again, the hoax email grossly exaggerates the facts. But I can't help but wonder, why in the heck would someone go through all the trouble to falsify facts and deliberately spread misinformation? And why don't people fact-check more before they unwittingly perpetuate the hoax? Clearly this is a case where the facts seem legit. I knew there was a cellphone ban that was passed recenty in CA, but I didn't know exactly when it went into effect until I starting researching it today. In fact, if the carpool lane fine amounts weren't so outrageous, I might've just assumed these "facts" were indeed factual and yelled at drivers on their cellphones, thinking that they were breaking the law. Maybe the original author of this bogus email was trying scare people into being better drivers. 8 feedbacks »	| In Rants | on Jun 21, 2007	| by joshmorgan | 1102 words, .